TEHRAN, Iran (CNN) -- Thousands of defiant protesters swept again Saturday into the streets of the Iranian capital, where they clashed with police armed with batons, tear gas and water cannons. Demonstrators run past a burning barricade Saturday on a street in Tehran, Iran. A stream of videos posted on social networking Web sites depicted scenes of chaos -- the sound of gunshots and helicopters whirring overhead and graphic images of wounded men and women being carried away. Unconfirmed reports put the death toll as high as 150 on the seventh day of post-election protests. Sources at one Tehran hospital confirmed 19 deaths Saturday. The International Campaign for Human Rights in Iran said numerous protesters who had been beaten and injured by security forces were arrested and detained when they sought medical treatment in hospitals. It said fear of arrest had reportedly driven injured protesters, some in serious condition, to seek care at foreign embassies. One woman, Shahnaz, said riot police used batons and water hoses to keep her and about 300 other people from reaching Revolution Square in central Tehran. She said she saw helicopters hovering and then she saw tear gas. Shahnaz is being identified only by her first name for safety reasons. At midnight, a stretch of a main avenue near Revolution Square was littered with rocks, street signs and burned tires and trash, witnesses said. Windows were shattered and hundreds of uniformed riot police lined the streets. In wealthy neighborhoods, reports surfaced late Saturday of raids by the Basiji militia, a paramilitary security force loyal to the government. 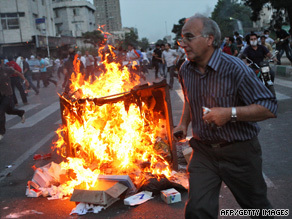 The demonstrations unfolded as opposition leader Mir Hossein Moussavi reportedly declared he was ready for "martyrdom." The message urged Moussavi's supporters to "protest" and "not go to work." "Today you are the media," said one message. "It is your duty to report and keep the hope alive." Iran's ruling system is "going to the slaughterhouse," a post on the site said. The post, attributed to Moussavi, reasserted his call for a new election to be overseen by an independent council. The authenticity of the information could not immediately be established, but its posting coincided with growing unrest by demonstrators, who complain that hardline President Mahmoud Ahmadinejad's election victory was rigged. One video showed a woman trying to protect a man being beaten and kicked by protesters near a motorcycle in flames. Another showed that the unrest had spread beyond the capital -- police clad in riot gear dispersing a crowd at a university in the southern city of Shiraz, beating screaming women with their batons. The chants from rooftops of "Allahu Akbar" (God is great) grew longer and louder. In a story posted Saturday on the Web site of the government-run Press TV, Iran's deputy police commander said 400 police personnel had been wounded since the opposition rallies began last weekend. "Families of those killed or injured in the events since June 12 have filed 2,000 complaints so far," acting Police Chief Brigadier Gen. Ahmad-Reza Radan told Iran's Fars news agency. Radan said 10,000 complaints had been filed by people asserting that their daily lives had been disrupted, adding, "They have called on the police to deal with rallies firmly." In Washington, President Obama urged the Iranian government to stop the violence. "If the Iranian government seeks the respect of the international community, it must respect the dignity of its own people and govern through consent, not coercion," the statement said. On Saturday night, the Iranian state-run news agency IRINN said an attacker had been killed earlier in the day outside Tehran at the entrance to the mausoleum that holds the body of Ayatollah Khomeini. The agency said the man "carrying the bomb" was killed, and there were no other casualties. Press TV was reporting that the bomber was the sole fatality, and that three other people were wounded at the shrine to Khomeini, the father of the Islamic Revolution that swept the shah of Iran from power in 1979. Khomeini is regarded as the founder of the Islamic Republic of Iran. Witnesses reported that cell phone service was cut off in the area after 5:30 p.m. Meanwhile, the Iranian government said Saturday it is ready to randomly recount up to 10 percent of "ballot boxes." The government agency that oversees elections, the Guardian Council, said it had received more than 600 complaints of irregularities from the three candidates.